Ben Pease is a man after my own heart, rambling through all the corners of SF — hidden or not — on foot. He gave his talk on March 17, 2011. 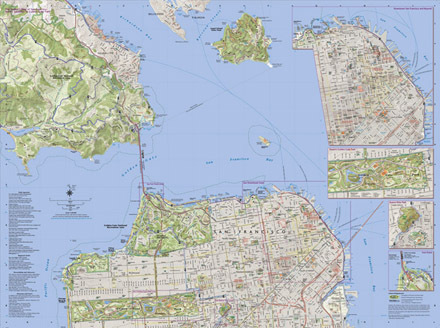 He discovered the pleasures of urban explorations at an early age, and soon came to cartography, and in helping to produce maps for others, began working on his own project to map the walking paths of San Francisco. Taking inspiration from other mapmakers, both foreign and from the past (he showed one particularly beautiful map of San Francisco, made by Chevalier, faithful but wonderfully illustrated), and getting clarity on many a trail from older maps, he experimented to create a map of the right scale, and created a wonderful map of the city (and a little bit beyond through San Bruno mountain and part of the margin headlands). He lead us in pictures through some of his favorite places: Lands End, the Embarcadero (viewing the bay from atop a pier), his own home patch in the Richmond District (with the smallest trail on the map), Candlestick Point, McClaren Park (with its springs and remnants of older owners), San Bruno Mountain (and a newly discovered path from the late 1800s), the Marin Headlands, Twin Peaks, and more. If you have a favorite place, feel free to share it in the comments below. If not, check out The Walker’s Map of San Francisco, and look to find it!